Let it be summer or winter, 6am or 8pm, there is one thing I always like to drink: coffee. I had my first sip when I was around six and I begged my mom to let me drink the last tiny drop in her cup – I hated it. But as weird as every kid is, I wanted to drink more so I seem more like an adult and by the time I actually grew up I started loving it more and more – this love hasn’t stopped growing yet, just today it reached a whole new level. Wanna hear a great story about coffee and someone amazingly determined? Yes? Here you go. 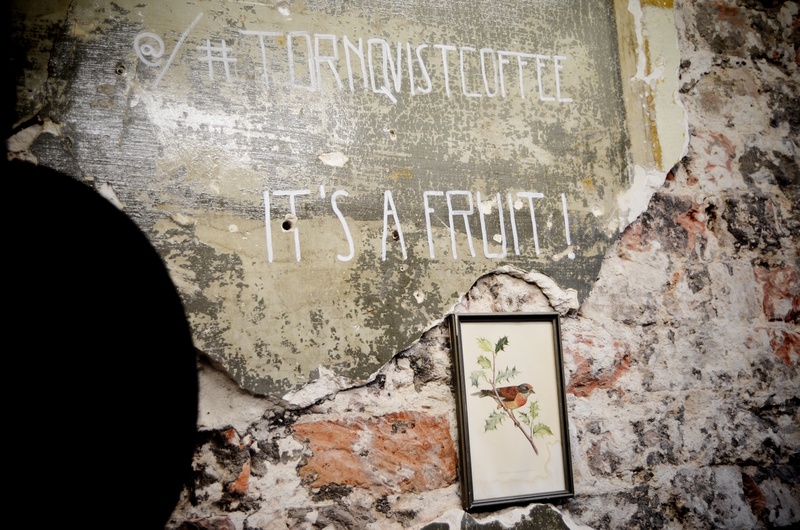 Also, did you know that coffee was a fruit? Today I didn’t have a cook but a barista, Linus. Imagine the most ambitious and passionate person you know, multiply that by five, put glasses on him – there you have it. Linus is half Finnish, half German, and his story starts a few years back. He and his brother really wanted to open a place that we all would like to have just around a corner: someplace to gather with friends around a big bowl of cheap, home-made food, of course made of quality ingredients, while having a nice talk and grabbing a cup of coffee or a glass of beer. Unfortunately this did not work out – although I’m hoping that once it will -, and they both took off at some point to travel around the world. When spending time in Australia multiple times, Linus learnt a lot about a perfectionist process of coffee preparation. To be honest, I had no idea before that the Australian were excelling in this field, did you? Best ones in the world! Nevertheless, after improving his skills, our barista took the next step and got a very old Volkswagen, one from 1972!, pimped it up and made it his own café on wheels. After visiting markets, birthdays, shop openings, and after many other days on the street with the old VW, Linus one day met some friends in Groningen at the Let’s Gro festival. One word let to another, resulting in him serving the BEST coffee for the opening of Groningen’s great barber shop, De Zwarte Raaf. 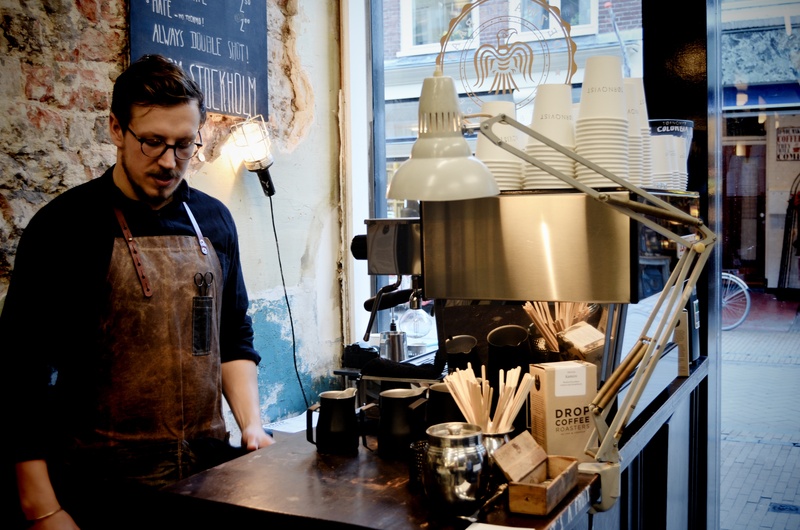 As everyone figured that the coffee Linus serves is simply fascinating, they wanted him permanently – so ever since there he is, having the Tornqvist Coffee corner in the barber shop. Why Tornqvist? His grandmother’s last name. And because this lady was one of the main drivers for Linus to follow his passion and work with coffee – the decision that ever since makes him very happy, and makes me think that I should consider a similar move. It’s all about passion, people! Specialty coffee refers to the greatest 9% of the coffee we can have. 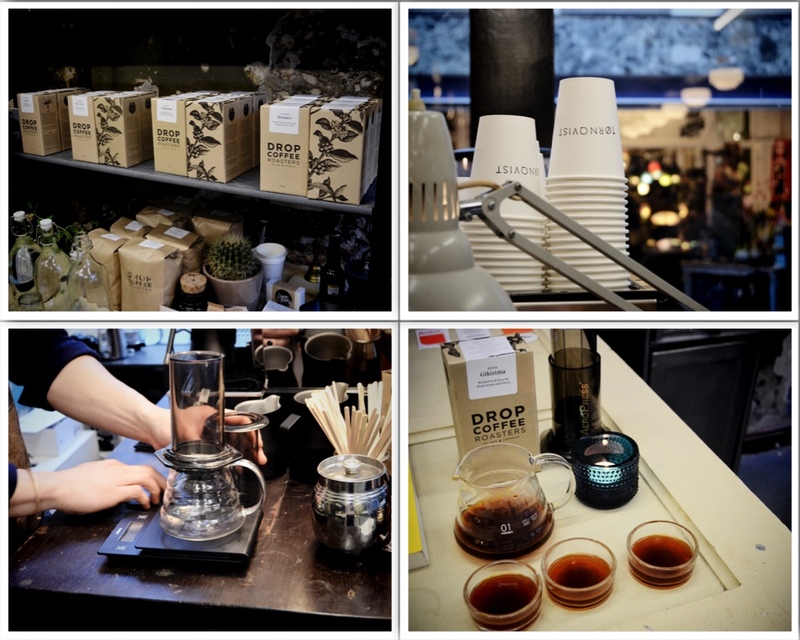 Drop Coffee is the best coffee roaster in Sweden and the third best in the world. So Tornqvist doesn’t simply serve specialty coffee, but pretty much the best you can get around, especially if you’re living the life up North! Today we started off with a flat white, which is a double espresso covered with foamy milk. It was made of a very fruity, Colombian fruit, which once was handpicked, sorted by size, weight, quality, then luckily after a long ride sent to us. 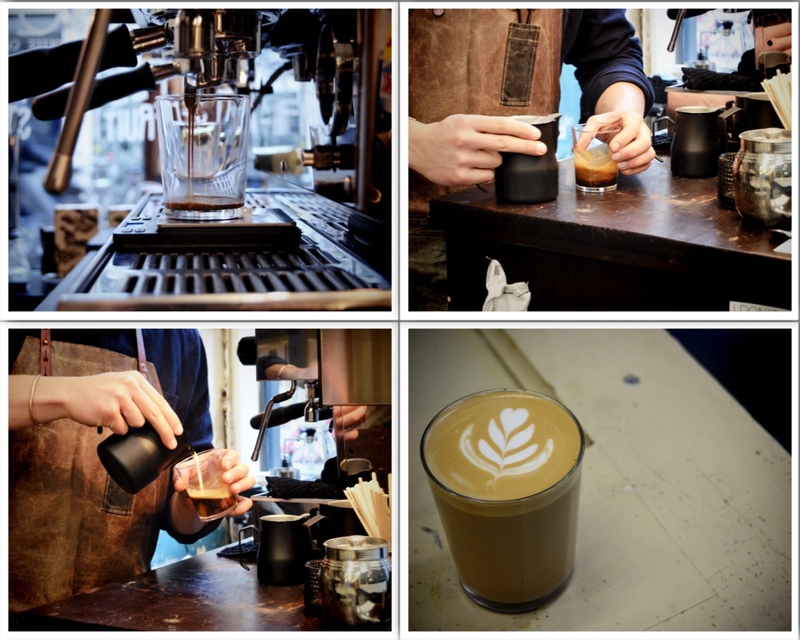 Drop Coffee is very picky about who they supply, so right now you can only get their finely roasted products in a handful of cities – of which one is Groningen! This one had a strong body, a highly fruity, pomegranate-like aroma and a chocolate-ish aftertaste. Next came a filter coffee made with AeroPress. The whole process seemed like science, I can only remember numbers: 91°C, 55 seconds, 1 minute and maybe 235 grams…? Never mind, the important thing is that I have never tasted anything like this before. It didn’t have a very firm taste as an espresso, but a more smooth, lemony, very fruity aroma with a pretty, light-roasted color – I could be drinking it the whole day so please go and do the same with this Kenyan miracle. I asked Linus what his favorite thing about coffee was and he said variety. Before today or even a few months back I probably would not have agreed with him and said that my favorite thing is how it wakes me up, how nice it smells when freshly roasted. But he actually found the most precise description of this incredible fruit/drink/companion, which I think we all love a lot! In the future our barista would like to open his own Scandinavian-stlye café – visiting it as many times as possible will be my mission, I hope yours too! But in the meantime, just look him up in Folkingestraat 25, Groningen – I promise it’ll be worth it.